If you’re thinking of listing your home, you may want to seriously consider moving up your time table. Why? Because waiting could be expensive! 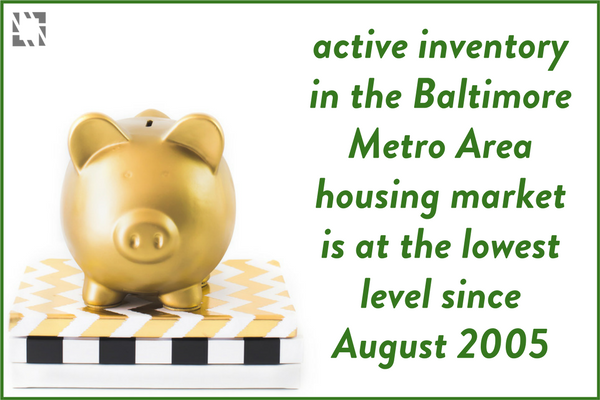 An analysis of the Baltimore Metro Area housing market shows that active inventory is at the lowest level since August 2005. Combine that with the average of only 38 days on market, and it’s hard to think of a better time to sell your home. If you wait until mid-Spring to put your home on the market, there are almost certain to be more homes for sale – meaning your home has more competition. Low inventory means buyers don’t have many options to choose from, creating more demand for your home. Such situations typically lead to multiple offers, and can cause a bidding war where motivated buyers increase their offers – netting you more money in your pocket. If you’ve been considering a move, take advantage of the current lack of inventory! Why wait? Find out what your home is worth in today’s market, or contact us directly at 410.979.6024 to schedule your confidential free home valuation. This year, it could pay dividends for you to list your home sooner. Bob Lucido Team is here to make that transition as easy as possible for you. That’s why we strive to deliver the ultimate real estate experience, going above and beyond to prepare, stage, photograph, list, market, and sell your home quickly and for top dollar. It’s all part of the Lucido difference.